Without further ado, here’s AmigaNG and his review of the AmigaOne X1000. Hope you’ll enjoy it! I have been an Amiga user since 1993 when I first got the Amiga A1200. I mainly got an Amiga because I wanted to learn programming. My brother had a Spectrum and he enjoyed the games and I always enjoyed programming on it, he moved on to the consoles, but I still wanted to program and back then the Amiga was highly regarded as a great programming computer with programs like AMOS, Blitz Basic and then the great graphic programs like Deluxe Paint etc. I did program a bit, but the Amiga introduced me to modern computing. I had very little time on a PC or any other computer up till my Amiga. I remember thinking just how neat the mouse was. I didn’t really appreciate how good and how easy the Amiga was to work with, not just in its programs, but for the OS, simple structure to the OS. I had Directory Opus (another legendary Amiga file program) and I do remember messing with ARexx Script to make the OS launch certain apps and do certain things all in one click. I just loved messing with it, a few years later I got to use a Windows machine and coming from my Amiga setup it just seemed a step backwards in terms of letting me, the user, have power, and it was very difficult to get to grips with how the Windows OS worked and just seemed no structure and over complicated. Though out the late 90’s I was hoping for an Amiga revival, mainly with Gateway plans for the AmigaMCC, but that fell through and I eventually had to get a PC to do my work on. I drifted away from the Amiga ever since, but always felt like something was missing, so I kept an eye on the Amiga scene to see what was going on. AmigaOS 4 did interest me a lot, but I felt it looked a little too unstable and incomplete to begin with in 2003. Eventually things changed, but then the dark cloud of the lawsuit happened between Hyperion and Amiga Inc. and so again was put off. 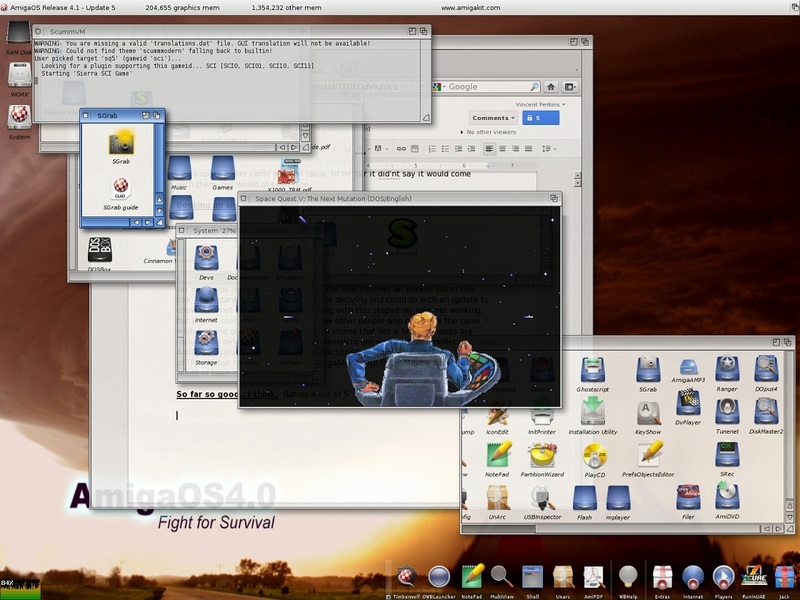 At the end of 2010 things started to look brighter for AmigaOS 4 as the lawsuit was over. I felt I should get a SAM system to try it out, then came along A-EON who announced the AmigaOne X1000. Tt sounded great, at last something that would advance the platform, so basically wanted to support their efforts, wanted to get back on an Amiga platform, plus I kind of felt if I got anything less than the AmigaOne X1000 I wouldn’t be happy. The price nearly put me off, but I think it’s the fact that I waited for a new Amiga for the last 15+ years I just thought, well it could be now or never, and I’m pleased with my choice and its great being back on an Amiga platform. So I’ve had the system just a little over a week and I thought I’d post a very quick little review of my feeling on the system so far and getting back to an Amiga. At a latter point I might do a more in-depth review for my website. I have to say the build up and promotion for the new Amiga was done very well by A-EON. The teaser-site way back at the beginning of all this was a great time, whether some felt let down or didn’t like being teased, it was great to see so much activity in the Amiga community. It was also good to see support given to the Amiga Future magazine by allowing them to usually give news updates and progress of the project before anyone else. Not only that, but A-EON and Hyperion supported and attended nearly every large Amiga show over the past two years and kept us updated with their email newsletter. I nearly gave them a perfect 5 out of 5, but I think the Summer 2010 tag line which I’m sure was put up in good faith at the time, was a little over optimistic. 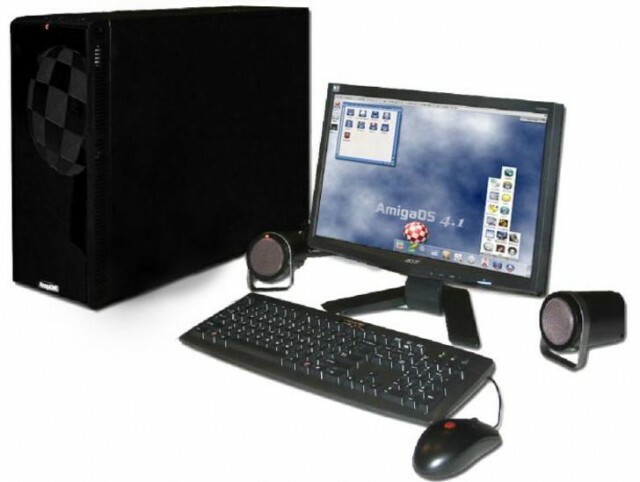 So finally after much waiting we could order our AmigaOne systems, it was a tough decision, I wanted the product, I liked the case, I wanted a OS4 system for a while and I wanted to support A-EON/Trevor in what he was trying to do. The problem was just the cost, it was a lot of money. Especially in these tough financial and uncertain times its hard to justify spending this much on a hobby, on any hobby, but at the end of the day I just thought I’d be disappointed with anything less and I felt I would be missing out. I’m glad I started saving up when I did and partly glad it took this long to come out, because I just about had enough money saved. The order went well if a little unusual, I found it a little odd that Amigakit just didn’t add the product to their store like other products, but instead created a special order page for it and the £1699 price tag without OS4 included was a bit of an odd decision. Why not just £1799 advertised with OS4? It was also worryingly a long time after the order did I know for sure if I even got an AmigaOne system, when rumors went around that they all sold out in a matter of hours. This only made matters worse. I felt this could have been improved a bit and a little more communication about the status of the systems would have been nice during the wait. But I can’t fault the fast delivery, the fast response to emails and the work AmigaKit have done on the case, accessories and behind the scenes. I think the pictures speak for themselves..
Boing ball not included, but had to dig it out for this day. As well as the stunning case work, so pleased the boing ball logo was engraved and not just printed or sticked on. The little extras were nice too, like having a matching white back plate, a white DVD drive, all nice touches. You also get a X1000 user guide, a technical manual on the Nemo board and an AmigaOS user guide. There are also PDF copies of each on the system, which are detailed enough to get you by and are nice to have. I can’t really complain here, although the only thing that might have been nice would have been a nice custom AmigaOne box. I know it’s an extra expense and really unnecessary, but it would have been a nice touch. Also, I know some users had dents into their systems. I felt like the packaging was enough. The hard drive was a little lose in my system, but I think that’s more down to the case hard drive bays, as it doesn’t have screws, but easy release bays. A bit too easy if you ask me, but all is fine. I just hope other people don’t suffer these problems and it may be wise to open your case up when you get it just to be sure everything is set up right and still secure. One other thing is that no cables came with the system. Luckily enough I had a spare power cable and DVI cable. To be fair it didn’t say it would come with them, but again, it would have been nice. Booting up a new system for the first time is special, no matter what system it is, but I think for me this was extra special seeing the X1000 BIOS image and then the AmigaOS logo. It was like a “Welcome back” feeling and a “Never thought I’d see this moment” feeling both at the same time. Booting takes just under a minute. It would be nice if it was faster, but it beats my PC and I might get a SSD drive when OS4.2 comes out to speed things up a bit. You get the normal OS4 greeting screen and a basic set up. It was nice that the audio, monitor and Internet all worked out of the box. The wizard Internet setup is a little deceiving and could do with an update to allow ethernet setup, as I found messing with this stopped my Internet working. After a quick look Online I found a few other people who had made the same mistakes and quickly got it sorted. It’s a shame that not a few more apps are included by default, but I suppose there is enough to get you started; TuneNet, AmiDVD, DVPlayer, OWB, IBrowse, Directory Opus, RunInUAE, YAM, AmiFTP, pFTP and others are included, but maybe a few games (even if they are demos) would have been nice. So far on my AmigaOne system I have used the Internet, posted on forums, Twitter, set up an account at Amigans.net, downloaded lots of apps and files from OS4 depot, sent and received emails via YAM, listened to MP3’s and Internet Radio, played CDs and DVDs, watched some video files, burnt off a backup copy of AmigaOS 4.1, pulled Photos off my phone, edited them, then uploaded them, had a quick go at editing music via Audio Evolution 4, played a few classic games, setup ScummVM and started playing Space Quest 5, set up AmiCygnix. Did a quick Srec test on the system, tried out Cinnamon Writer and then decided to see if I could write-up a review using Timberwolf running Google Docs. These are typical everyday tasks for a computer and I am loving the fact that I can do all this on an Amiga system. However to get to this point has been one of much learning. You see the biggest problem I have is usually finding the required libraries so that apps can work. Some are great and include everything you need to get up and go, but it is annoying when you come across an app that requires a special library and sometimes don’t even say what they need in the read me. DVPlayer was one of these. Getting it to play DVD’s and audio was interesting. ScummVM was another program that had me on a little Easter egg hunt for a while. However, part of me enjoys it, because setting up these various programs brings me back to learning Workbench and where things go. It’s not that hard and there is one great community I can ask if I get into trouble. I’ve experienced a few Guru Meditation errors and lock ups mainly when testing if a classic app can run in OS4. Wordworth 7 is one I checked recently, which I thought did work, but doesn’t yet on my system anyway. I haven’t had time to see if there is a solution yet. So it has not been smooth sailing, but it has been fun setting up my Amiga. In a kind of odd way each time I’m going on my AmigaOne I’m usually setting up to do something new or learning something new about the system, which is pretty neat. So far I have to say speed wise the system seems fast enough. I’m a little bit disappointed by Srec performance, as I was hoping it could handle that better, but not to sure if I had all the right settings and codecs set up on the system, so may be able to set it up better. Another slight annoying thing is a few times I had Guru I’ve asked it to kill the process, but the program just keeps running. It will let me carry on using the computer, but most of the time it just eventually freeze up my system to the point were I can’t even do resets, so I started to learn if that happens it is better to do a quick reset there and then (which takes only about 15 secs). So, was it worth it? I’d have to say it’s a wait and see. If I had paid half the amount I would have to say yes, absolutely I would have recommend it to every Amiga user out there to save up and get one. 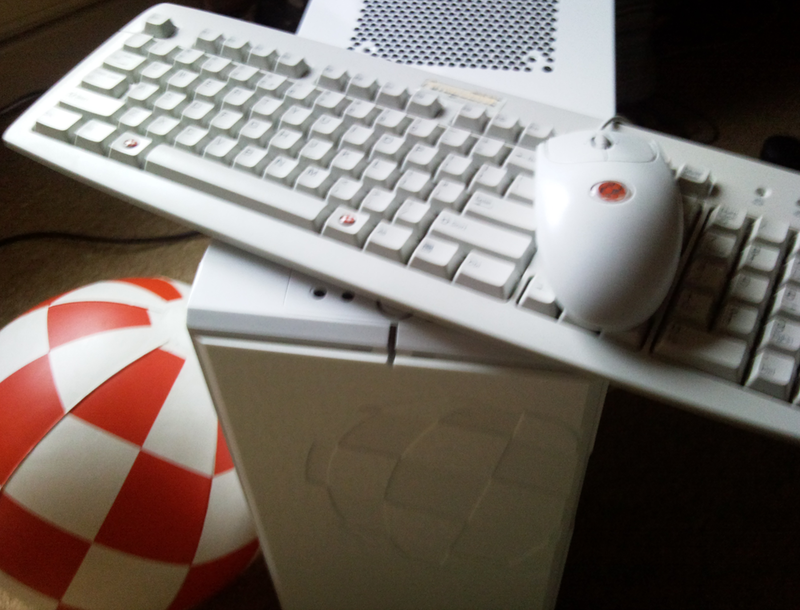 I’m so glad I got one and I have been enjoying AmigaOS 4 and slowly getting it set up to be a better and better machine. But it was (for me anyway) an extra push to get this machine. I completely understand the cost of designing a custom-made machine and it’s nice that it is a computer that I can say was “Designed in England, Made in England” (OK, so the case was made in China). I think its true value and whether it was worth the extra push we will see over the next few years. What happens to the AmigaOS, will the X1000 and the netbook give us a bit more of a thriving market, will XMOS come in handy, will we get dual core support? But no matter what happens, I got more than enough stuff to be getting on with and enjoying on my new machine, so pleased Space Quest 5 works, that will keep me busy for a while. I think things can only get better and we must try to keep this party going and I would like to thank, A-EON, Amigakit, Hyperion and all involved in this project in making it happen. Many thanks to AmigaNG for reviewing the AmigaOne X1000 and for letting us read it here on this blog. 🙂 Sharing this with us is much appreciated. You are welcome back anytime if you’ve got something else you want to share. Yes, it’s great news! 🙂 Let’s hope more people will follow. Thanks! 🙂 I think AmigANG did a great job with that review. This is insane. 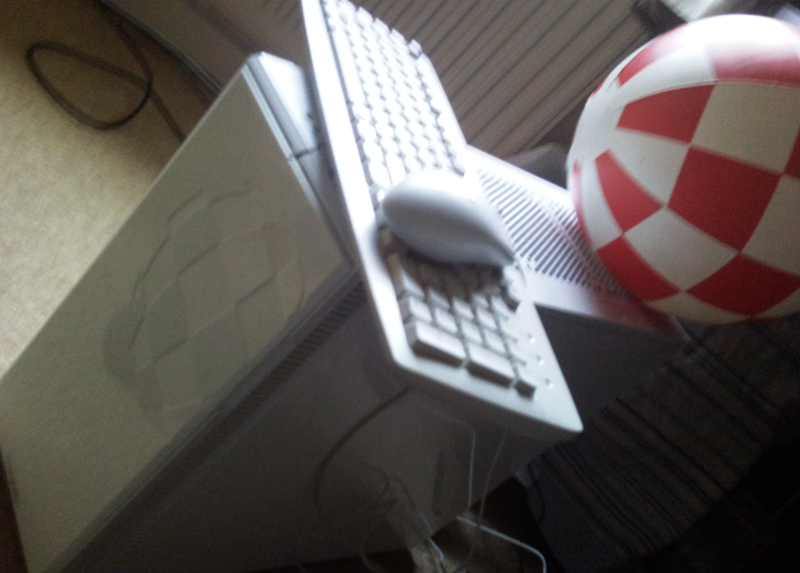 A modified Fractal Design Case and a mouse and keyboard with Amiga balls stuck on (not even embedded) and they want £1,800!! What are you going to run on it? OS4.1 big deal. I’ll stick with my retro gear.